When our sow gave birth to her drove of piglets, not all of them survived the first 24 hours. Plenty of piglets made it, enough so that we are full up in our mobile pig pens, and have strung up electric wire so the biggest pigs can clear the property line. 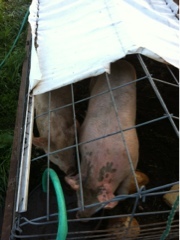 When we went to wean the pigs, the smallest one was picked on, so that one went back with mama. As the only one left from that drove with her, the smallest quickly outgrew all its siblings, and is the biggest by far. Almost twice the size at the same age.